NGC 2736 is also known as the Pencil Nebula or Herschel�s Ray and is at the eastern edge of the huge Vela supernova remnant (SNR). It was discovered by John Herschel in 1835 and lies almost exactly on the galactic equator. The supernova that created the Vela SNR exploded about 11,000 years ago, so the nebula has been expanding and colliding with interstellar dust and gas ever since. Even now, the Pencil nebula is expanding through space at �only� 644,000 miles per hour compared to the millions of miles per hour initially after the explosion. Much of the Vela SNR at visible wavelengths is comprised of wispy curves of mixed red and blue-green colors (see my 2008 image). At X-Ray wavelengths from the ROSAT satellite, the Vela SNR is reasonably circular, suggesting a spherical object. The Pencil nebula is relatively bright and has an unusual linear, spindly appearance that is about 5 light years long at a distance of 800 light years, so it is relatively close for most objects that we image. Galaxies are millions of light years away. Planetary nebula are typically thousands of light years away. In the image above, north is up and the vertical scale is about 32 arcminutes. 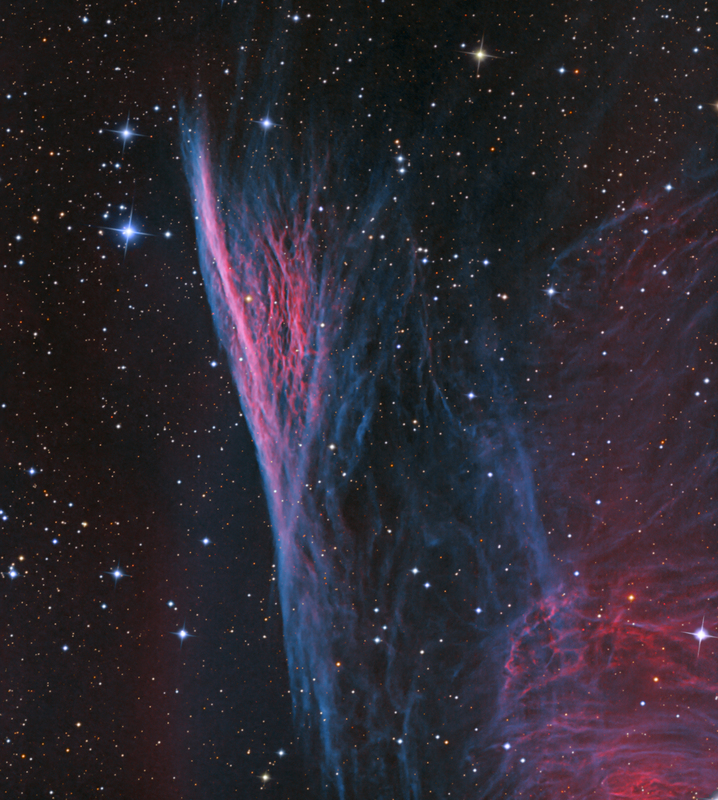 10 hours each of Oxygen (OIII, 3 nm) and Hydrogen-alpha (H-a, 5 nm) narrowband data were used to bring out the wispy detail of the Pencil nebula. They were color mapped to blue-green and red, respectively, to achieve a natural color. 2.5 hours of RGB data were used for star colors.